My cartoons are available to license and download at affordable rates for websites, social media, presentations, newsletters, e-mail campaigns, advertising, publications, public speaking events and more. When you find a cartoon you like, just click the image to view the larger cartoon and download options. 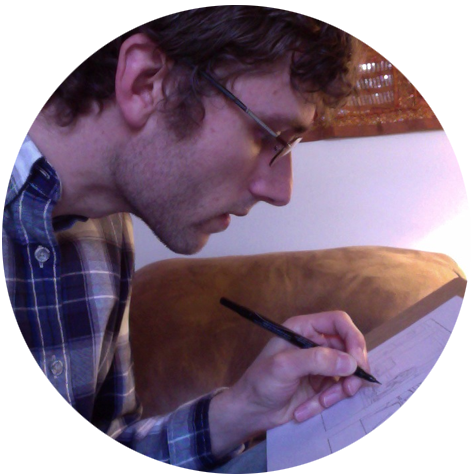 I get a lot of messages from fellow artists and cartoonists about how I built the Humoresque Cartoons website, and how they might go about creating a website to sell their own artwork online. The fact is, whether you’re an established artist or just getting started in your field, having your own website is an essential part of your career as an artist. When you sell your artwork on marketplaces and stock sites (like Cartoonstock, Shutterstock, or Toonpool), there is always a moderation process. That means you do not have complete control over what you’re allowed to post. Even if you run your own Facebook page, your content is often censored. Having your own website gives you a creative oasis where anything goes and your imagination is the only arbiter. Having your own website gives you an established online presence. It stakes out a place for you in the world community and makes a statement about your legitimacy as a professional. You can also start showing up in potential clients’ Google searches if they are looking for your particular style of artwork or sense of humor. Moreover, your work is more likely to get found online and spread around on social media. Having a quick link to your website is like being able to hand out an online business card. Even if someone heard about you from another source, they might want to learn more about you and view a larger selection of your work. By being able to direct people to your website, you can show them the breadth and seriousness of your work, and also make a better impression than sending someone to an Instagram feed or a catalog of your work on some other site. In this tutorial, I’m going to show you how to create a beautiful and functional website to sell your artwork or photography. The whole process should only take about 30 minutes. Ok, so let’s dive right in… I’m going to take you through this step-by-step, using the same process I used to build this website. In order to get your website up and running, you need two basic things: a domain name, (i.e. google.com) and web hosting. The domain name is your online address, and the hosting provider keeps your site up and visible. You can set up both of these at the same time by purchasing a domain name through your hosting provider. There are a lot of hosting providers, but the best one I’ve ever used is SiteGround. Quite simply, this is because they are the easiest to use and have amazing, knowledgeable tech support if you ever run into problems while you’re building your website. They are also very affordable. Click here to open the SiteGround page in a new window. First, you’ll need to select a hosting plan. 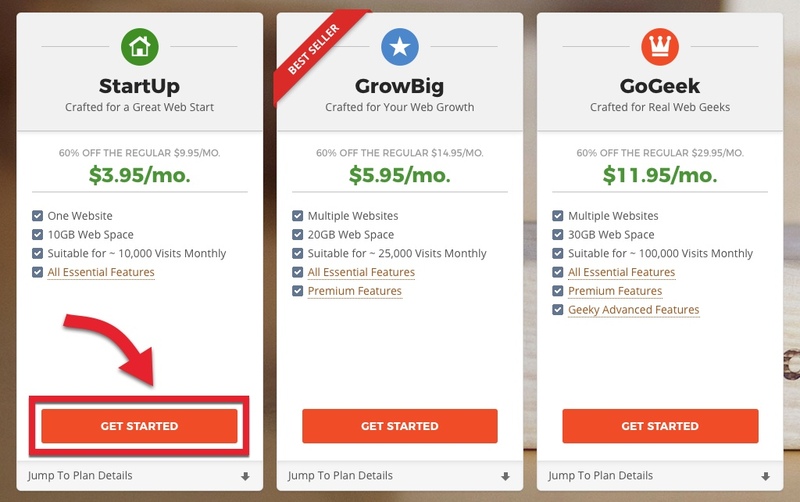 If you’re just starting out and not expecting more than 100 visitors per day, the StartUp plan should be fine for you. If you think you’ll get a lot of heavy traffic to your site right away, you’ll want to go with one of the larger plans. Next, you’re going to register your domain name. I would recommend being as simple as possible, with as few hyphens or special characters as you can. You want the domain name to be easy to type and recognize, or be simply your name or the name of your brand. I would also suggest only using the .com, .net, or .org extensions, as they are the most authoritative and easiest for search engines to find. After clicking the Proceed button, you’ll be directed to the payment page, where you can complete your order. You will then be directed to the SiteGround Installation wizard (pictured below), where you will be installing the Content Management System, or CMS, for your website. This is what we call the “backend” which is where you will manage all your site postings and admin operations. The most versatile and easy-to-learn CMS is WordPress. 1. Click the “Start a new website” option. 2. Select the “WordPress” Box. 3. Fill in your information. This is what you will use to login to the backend of your website. Success! Your website is now live and running. If you visit your domain name, you should see a placeholder site with a default theme. We’re going to learn how to change that right now so you can give it your own look. WordPress was originally a blogging platform, and by default, it is still set up for that purpose. These days, however, WordPress has evolved into a platform that can handle almost any kind of website you can imagine. There are two main components, or add-ons, that make this possible: Themes and Plugins. Themes determine the overall look, feel, and functionality of your site. You only have one theme. Plugins give you extra features and functionalities that allow you to tweak your site exactly how you want. You can have a vast array and combination of different plugins working together. The theme governs everything about how your website looks and functions. There are thousands of free themes for WordPress, but if you want to save yourself a lot of trouble learning code and web design, you’re going to want to invest in a pre-made premium theme. 1. Click the Buy Now button, and you will be redirected to the checkout page. 2. Fill in your first name, last name & email address then click Next. 3. Choose your Themeforest username and password, and then click the Create Account & Continue button. 4. Fill in your billing details (full name and address), then click the Save and Continue button. You will then be redirected to the payments page (above), which includes 3 payment methods. The first two methods are Debit/Credit card and PayPal. These two methods include a $2 surcharge. 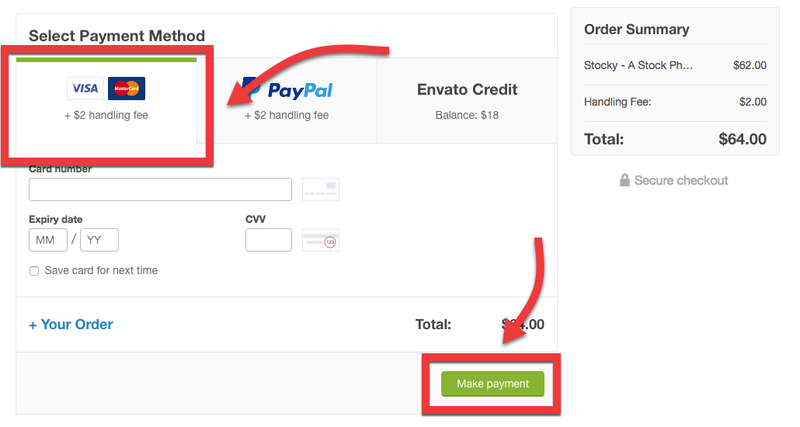 If you want to avoid this surcharge, then you can put money into “Envato Credit” and then go through one more checkout step. After your payment is processed, you’ll see a success message. Now, hover over your username in the upper right corner of your screen, and select “Downloads” from the menu that appears. Next, you’ll see the “Stocky” Theme in your downloads list. Click the green “Download” button and select “Downloadable WordPress files only” from the dropdown that appears. This will save your theme as a .zip file to your computer. The Stocky theme will make your site and images look great, but in order to function properly, you’re going to also need to download a free plugin called Easy Digital Downloads. Easy Digital Downloads (EDD) gives you a complete turnkey shopping cart and checkout experience allowing people to buy and immediately download your images directly from your website. Click the Download button to save the EDD plugin to your computer as a .zip file. 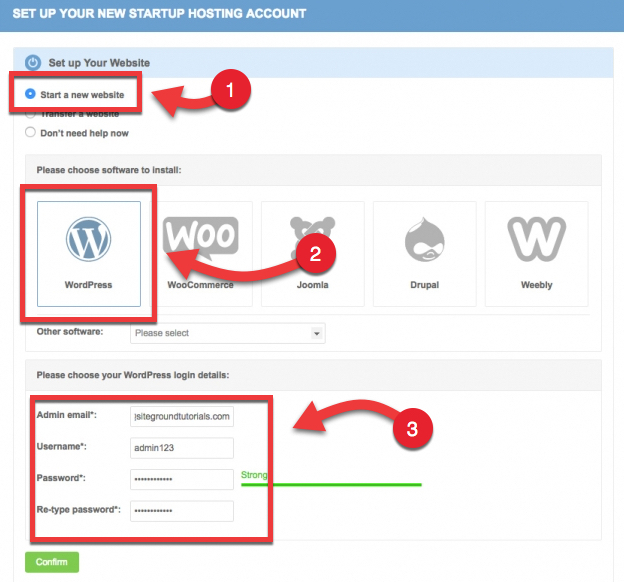 Now let’s go through the first steps to set up your website. Now, look over to the left panel for the Appearance tab. Hover over it, and click on Themes. 1. Click the Upload Theme button on the top of the page. 2. 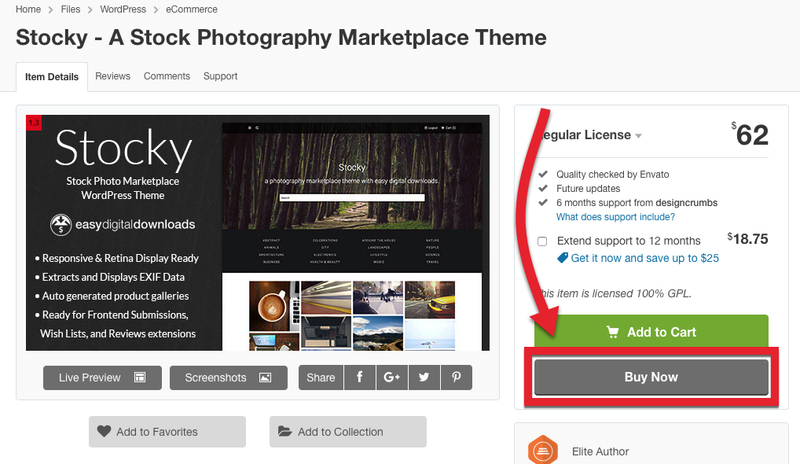 Click the Browse button to upload the Stocky .zip file you downloaded from Themeforest. 3. Click the Install Now button. Once you get the message that your theme has been installed successfully, go ahead and click the Activate button on the bottom menu of the screen. Go back to the left panel and hover over the Plugins tab. When the menu opens, select Add New. 1. Click the Upload Plugin button on the top of the page. 2. Click the Browse button to upload the Easy Digital Downloads .zip file you downloaded earlier. When the success screen comes up once again, click Activate. Now you have your entire framework in place. If you visit your homepage, it should look a lot like the demo for the Stocky theme. Now you can start uploading your images to start selling your art… Have fun! If you run into any problems following these steps, please feel free to let me know in the comments below and I’d be happy to clarify. If you are looking for cartoons, you've come to the right place. Here at Humoresque Cartoons, you can search and download the funniest and most relevant new cartoons to use in any kind of electronic media or print publication. Add some humor to your next project with a cartoon! My cartoons are available to immediately license and download for presentations, newsletters, training materials, websites, social media, advertising, magazine usage, print runs in newspapers, and any kind of print or electronic media. 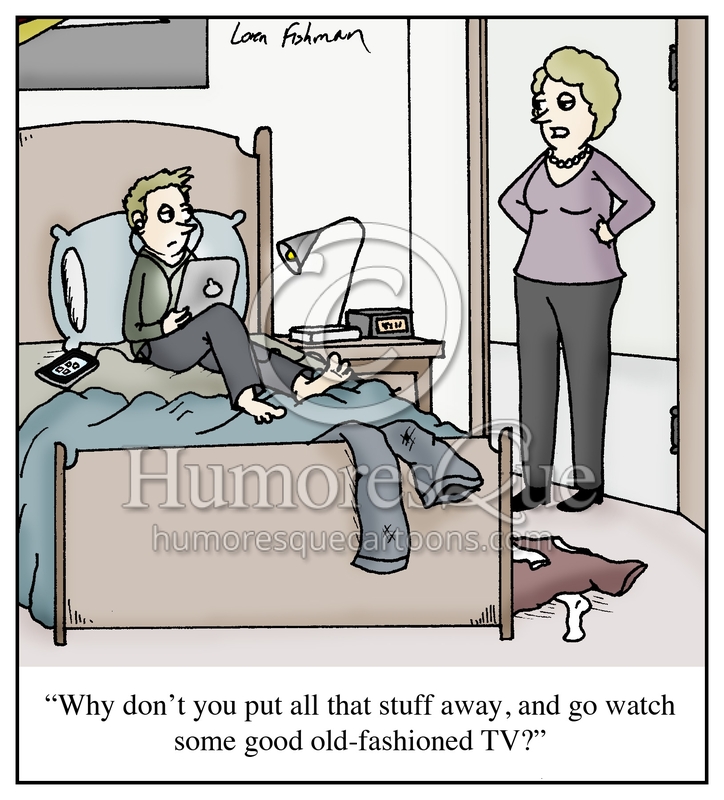 Cartoons are a great way to communicate your message about with humor. If you don't find exactly the cartoon you need, I can be hired to create a custom cartoon specifically for your project. Custom cartoons are priced to fit the budget of any individual or organization and are a great way to get your own unique message across with humor. Learn more about cartoon services.